and one fewer cats than it looks like. These are thoughts on cats and beef jerky, not thoughts on cat and beef jerky. If you have only one cat, your mileage may vary, and you’ll understand why in a minute. For that matter, if your cats are normal cats and not monster cats with laser x-ray vision, your mileage may vary. My cats apparently do have x-ray vision or else how did they know the beef jerky was in the pantry? 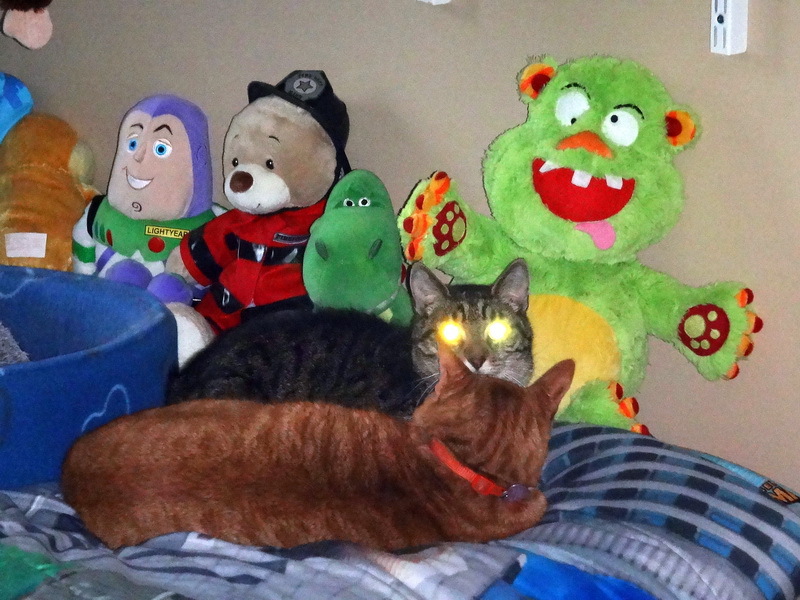 I already knew about their laser vision because Buddy once tried to kill me for photographing him and Mr. Jinx in a compromising position. The accompanying photo remains, but the camera is toast. In any case, I’ve learned several lessons about cats and beef jerky tonight, some good and some bad. I’ll pass them along on the chance that doing so may spare some poor cat loving soul from involuntary commitment. The unopened thick plastic bag is not sufficient to keep the cats out of the beef jerky. Six feet of elevation in a cramped pantry is not sufficient to keep the cats out of the beef jerky. A closed pantry door is not sufficient to keep cats out of the beef jerky. Although individually any of these things should present a formidible barrier between the cats and the beef jerky, it turns out that even the combination of all of these things is not sufficient to keep cats out of beef jerky. Having established that anything less than extraordinary measures is insufficient to protect beef jerky from cats, what else have we learned tonight? We have learned that, having retrieved and then opened the beef jerky, cats will fight for the bag. One will drag it around the house while one or two more will chase him. I’m not sure whether this is one cat attempting to hoard the beef jerky or perhaps it is intended to achieve the widest possible distribution of meat throughout the house. If it is the former, then they have failed miserably because no single cat seems to have retained the prize and the empty bag was quickly discarded. However if the intent was the widest possible meat distribution then the technique was a spectacular success. I expect that for the next several days, my wife and I will be picking meat crumbs out of the couch, off the rugs, from under the baseboards, refrigerator and server, out of the floor vents, and pretty much everywhere else. After that, we can just follow the ant trails. It may actually be easier and quicker to just burn the place down and start over. I bet it would smell like one right tasty barbecue. The good news in all of this is that having emptied the bag of its contents, the cats very quickly pick up all the bigger pieces so you don’t have to. In fact, you’d have to look closely to see the virtual slaughterhouse that is the downstairs portion of my house right now. Because there are three cats in our house and they each are afraid of not getting their fair share, not only do they clean up the beef jerky, but they do it really fast. Imagine a Roomba that only picks up meat but also has legs and can get meat out of high places. That would be a really cool Roomba, assuming it’s not the thing that spread the meat around the house in the first place. Having shared this nugget of good news, it’s all bad news from here. For instance, once the feeding frenzy has eliminated all but one piece of jerky, a massive fight breaks out. The ruckus of spreading the meat around the house sounds like ordinary kitty playground activity. The commotion that arose over that last piece of jerky would be more aptly compared to a Black Friday Midnight Madness sale at a store where all Apple devices were on sale for $1 each with no limit but only 10 of each device were on hand. There was howling, growling, screeching, hissing, caterwauling, and something that sounded like all three cats were scratching a blackboard at once. I thought the cat-pocalypse had arrived. It was at this point that I intervened and nearly lost another finger trying to get that last piece of beef jerky away before one of the cats got himself killed. When I finally managed to wrestle it away from Buddy, it was shredded to the point of being fuzzy. But it still tasted good. Oscar slunk off to the couch where I thought he was licking his wounds. Then I turned on the light and realized he was licking meat crumbs off the couch. They were everywhere. In the unforgiving overhead light, the rug looked like someone had shaken a pepper grinder over it except the pepper was meat. Lots and lots of meat. Having been married 30 years, I know now not to run the vacuum cleaner at night when she’s asleep. Instead I got down on all fours and picked up as much as possible by hand. For a while, I thought that I might get enough of it up so that my wife did not wake to a house that smelled like a jerky drying hut. That was when the puking started. Which I totally understand. It’s not their fault. They wolfed down a lot of stuff they should not have eaten and I’m actually kind of glad it’s coming up. Less chance of problems tomorrow, if you know what I mean. Unfortunately, I’m lazy and thought it’d be a good idea to intervene between the puking cats and the rug. Even more unfortunately, it really freaks the cats out if they start to puke and you run up and shove a paper towel under their mouth. While I had some initial success, this quickly backfired on me when they all started puking at once and, on seeing me approach with paper towel in hand, quickly sought out places to puke in private. Like the floor of the closet where we keep the cleaning supplies and the door of which I’d left open. And the top of the refrigerator. And the top of the kitchen cabinets. Behind the couch. Behind the TV. In a floor vent. Yes, that’s right, one of my cats puked beef jerky into a floor vent. Probably best if you don’t come over for a day or two. Of course, it’s too much to hope that they got all of the jerky out the way it went in. Tomorrow’s forecast is widespread sunshine followed by a massive shitestorm. Tomorrow the sound of cat bells will fill me with dread. Tomorrow ask not for whom the cat bell tolls, find some good reason to be out of the house on business. Because if I’ve learned one thing in 30 years of marriage, it’s when to ask for permission and when to ask for forgiveness. Tomorrow when all three cats have diarrhea at the same time what I’ll be asking for is asylum in a non-extradition country. Now I’ve learned my lesson. Assuming I live through the next day or two, no more beef jerky in the pantry. I have just the place to keep it, though. Some place where the cats will never get it. The only thing I have to worry about is the emotional scarring of the firefighters if, in fact, it is necessary to burn the place down and start over. Well, yeah. What’s special is that the recipe for beef jerky is also the recipe for a major cat-tastrophe if you are not careful. And if some unlucky firefighter spends a lifetime wondering and goes to their grave never knowing why there was beef jerky in the fire safe, that’s their own fault. They rescue cats for a living. If they’d kept a couple of those rescued cats, they’d understand. This entry was posted in Humor and tagged fail, humor, life. Bookmark the permalink. In my experience, the bag is safe until it is opened for the first time…then it is either in a closed drawer, or when I’m being more smart and less lazy, the designated plastic jerky tub. They don’t puke when I give it to them as treats though…Harvey loves it! Starvin Marvin will pester me until I give him a piece, but won’t actually eat it. A.L.O.M. is the one who will find any unsecured bag and shred it to get at the jerky. I found this while trying to find out if beef jerky was bad for cats. While transferring some into a smaller bag, I missed a piece which the cat found immediately. I took it away and he hissed but luckily my fingers survived any injury. I could only imagine what would have happened had the two of them got into a bag of it. Great blog post! If you happen to have a list of non-extradition countries handy it would be helpful. I made the mistake of reading this in bed AFTER calming the girlfriend down after she nearly lost a finger or three to a cat-related beef jerky incident. Turns out laughing isn’t what she needed to hear while trying to sleep and forget the whole incident. Actually, I *do* have a list of non-extradition countries but I got it from my cat so I would not put too much faith in it. As for dog houses, this one looks soft and comfortable. Sounds like a guy who knows cats. I have lived with cats who will steal food from your plate and those who won’t touch people food. The complexities of cats are what made Hemingway and me love them. I don’t know that “knows cats” is how I’d describe it. I know they consider me to be their staff assistant and that I don’t live up to their expectations of a servant. And I know that in what is either an unguarded moment or an Oscar-worthy performance they appear to like me for a few seconds every now and then. Other than that they are a complete mystery to me. Like for example, I never figured out what it is that makes them decide to suddenly race out of the room at full speed, then stop and lie back down in the adjacent room like nothing had happened. And I know that if I spend too much time trying to figure them out I go cat-atonic. I have to admit I’d love them just a bit more if they scratched the posts I bought/made them instead of ripping the carpet off the stairs. If you and Hemmingway ignored the carpet problem, you are better humans than I. Which I’m sure my cats would agree to. So those big bags at the grocery are not for home use? Who eats a quarter pound of jerky all at once? hmm, my nearest supermarket (Whole Foods) doesn’t even have small bags of beef jerkey, darn it! I live in England & all we get are pathetic little bags with pathetic little squares of beef jerky. How I long for a giant sack of the stuff, huge strips I can grasp in my hand.